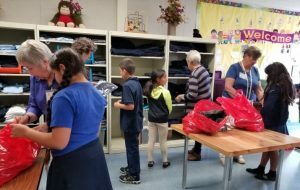 Since 1993, members of Assistance League of Ventura County, through Operation School Bell, have provided new school clothing to children in need from the Oxnard, Hueneme and Ocean View Elementary School Districts. In 2010, the program was expanded to include children from the Ventura Unified School District. 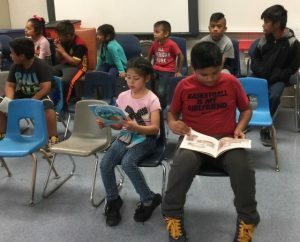 The children are referred to Operation School Bell by school personnel and are brought to one of two Operation School Bell sites by school bus. At Operation School Bell, each child receives two shirts, a sweatshirt, socks, underwear, a gift card for pants, shorts or skirts, a gift card for shoes, a personal hygiene kit, school supplies and an age-appropriate book. Having clothes of their very own that fit properly has increased confidence and self-esteem of these students and has given them a sense of belonging to the school community. Parents, teachers and administrators have commented on how proud and happy the children are to go to school with all new clothes, many for the first time. Operation School Bell is run entirely by chapter member volunteers who purchase the clothing, stock the “store,” maintain inventory and assist the children in selecting their new clothes. During the 2017-2018 school year, 1,362 children received new school clothes and supplies, 23,913 since the program began. Operation School Bell is not a revenue-generating program. It relies heavily on donations from grants and individual and corporate donations. 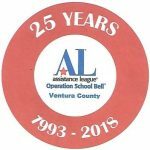 Assistance League’s Operation School Bell Program was recognized by the Oxnard School District Board of Trustees and the Oxnard School District Superintendent at their June 2015 regular Board meeting. Marikaye Phipps, Oxnard School District Pupil Services Director, presented recognition plaques to member volunteers of Assistance League. Receiving the award on behalf of Assistance League are Marcia Semple, Barbara Houser, Sally Keevy and Linda Krahenbuhl. On September 8, 2015, Operation School Bell clothed its 20,000th child. Along with the 44 students and school personnel from Art Haycox Elementary School and Assistance League volunteers for the day, attending were the two people who were instrumental in establishing the program in 1993, Assistance League’s Barbara Houser and former Oxnard School District Superintendent, Richard Duarte. The Ventura County Star Reporter interviewed them and others while the photographer took many pictures for their newspaper article. Large banners, balloons and refreshments added to the festivities.